Sustainability is a goal for the whole world these days as people realize not only the price of energy but the fragility of our environment. India has lots and lots of sunshine, that is for sure. Gujarat, the state where we were living, had a combination of solar and water plant. The panels were placed over a canal to integrate the two sources of energy and slow the evaporation of the water. 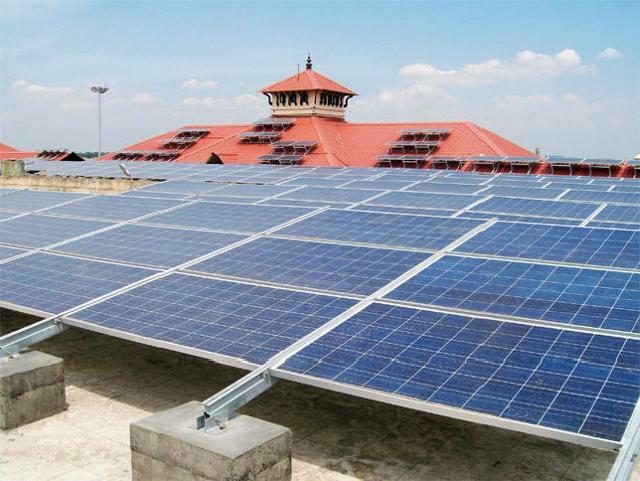 Now Cochin, in Kerala, has opened the first solar airport in India. . . and I assume the world , that is designed and built to be 100 sustainable with solar energy. We visited Kerala and had the relaxing canal backwater boat ride. We flew from Cochin to Mumbai, but most admit we didn’t notice the field of panels. Phoenix has been talking about becoming a 100% solar city. Talking, is about it! There is no shortage of sun there , very similar to India. The great difference is that India is pressing onward to complete these plans. Remember when they launched the rocket to Mars last year? And the amazing pictures of Mars shown to earth, a few months ago? Enough said, about Incredible India! This entry was posted in Architecture, India, Travel, Uncategorized and tagged 100% Solar Airport, Arizona, Cochin, India, Indian initiative, Indian work ethic, Kerala, Kerala India, Phoenix, solar energy, sustainability. Bookmark the permalink. Cool.. . . . .huh?